Edith Stein was born in Breslau on 12 October 1891, the youngest of 11, as her family were celebrating Yom Kippur. Edith’s father, who ran a timber business, died when she had only just turned two. 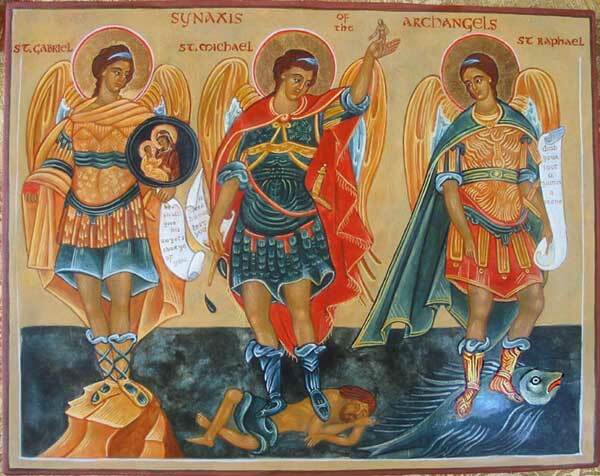 Her mother, originally devout, abandoned her Jewish faith. In 1911 Edith passed her high school graduation exam, and enrolled at the University of Breslau to study German and history, but in 1913 transferred to Gottingen University, to study philosophy under Edmund Husserl. She became his pupil and teaching assistant, and he later tutored her for a doctorate. At the time, anyone who was interested in philosophy was fascinated by Husserl’s new view of reality, whereby the world as we perceive it does not merely exist in a Kantian way, in our subjective perception. His pupils saw his philosophy as a return to objects: “back to things”. Husserl’s phenomenology unwittingly led many of his pupils to the Christian faith. In G6ttingen Edith Stein also met the philosopher Max Scheler, who directed her attention to Roman Catholicism. 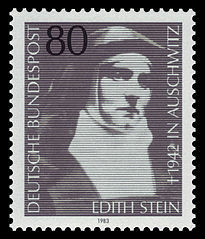 On 1 January 1922 Edith Stein was baptized. Until 1931 she held a position teaching German and history at the Dominican Sisters’ school and teacher training college of St. Magdalen’s Convent in Speyer. In 1933 she joined the Carmelite Convent of Cologne and was invested the following year, taking the name of Teresia Benedicta a Cruce – Teresa, Blessed of the Cross. In 1938, as anti-semitism raged in Germany, she was smuggled across the border into the Netherlands, to the Carmelite Convent in Echt. After the Nazi occupation of the Netherlands, Roman Catholic Bishops spoke out against pogroms and mistreatment of Jews. In retaliation Edith Stein and her blood sister, Rosa, (now also a Carmelite) were arrested by the Gestapo on 2 August 1942, while she was in the chapel with the other sisters. In a few days they were transported to Auschwitz. Probably on August 9th, Sister Teresia Benedicta a Cruce, her sister and many other of her people were gassed.